Place soy sauce, sake, brown sugar, ginger and garlic in a saucepan and bring to a boil. Reduce heat and simmer just until the sugar is dissolved. Remove from heat and cool. Pour soy marinade over chicken and marinate for at least 2 hours or overnight. Remove chicken from marinade, reserving the liquid. Transfer marinade to a saucepan and bring to a boil; cook until liquid is reduced to ½ cup. Grill or broil chicken until done; baste with the reduced marinade halfway through cooking process and again when completely cooked. Slice chicken thinly or chop into cubes, and toss with remaining marinade. Set aside. 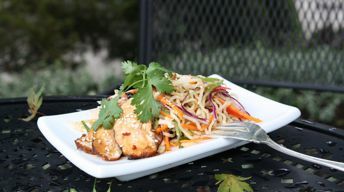 To serve: Place noodle salad on serving platter and top with teriyaki chicken. Place noodles in a large bowl; toss with about half the dressing. Toss in vegetables. Taste and add more dressing as needed. Place vinegar, soy sauce, oyster sauce, garlic and ginger in a blender. Blend well and with the motor running slowly drizzle in the oils.